Last week I had the privilege of once again spending time on the Great Blasket Island, off the Dingle peninsular, Co Kerry Ireland. This is always a highlight of our annual holiday in Ventry. The marine and bird life never ceases to amaze, this year ticking seals, basking sharks, minke whale, dolphin, gannets, puffins and much much more. The beach on the island is in my mind one of the best beaches in the world, and on a hot suny day the white bright sand can take you to the Caribbean. It really does feel like the end of the land out here, with the walk out over the highest point to the end of the island one of the most dramatic walks anywhere. The island lies approximately 2 km from the mainland at Dunmore Head, and extends 6 km to the southwest, rising to 292 metres at its highest point (Croaghmore). Despite its close proximity to the mainland, visitors to the Dingle coast can often not see the island through the notorious sea mist. The island was inhabited until 1953, when the Irish government decided that it could no longer guarantee the safety of the remaining population. It was the home of three noted Irish writers: Tomás Ó Criomhthain, Peig Sayers and Muiris Ó Súilleabháin. Their works were all written in Irish, and have all been translated into English, as well as other languages. The homes of Tomás Ó Criomhthain and Muiris Ó Súilleabháin are now in ruins but the house in which Sayers once lived has been restored, and used to form part of the hostel which previously functioned on the island. 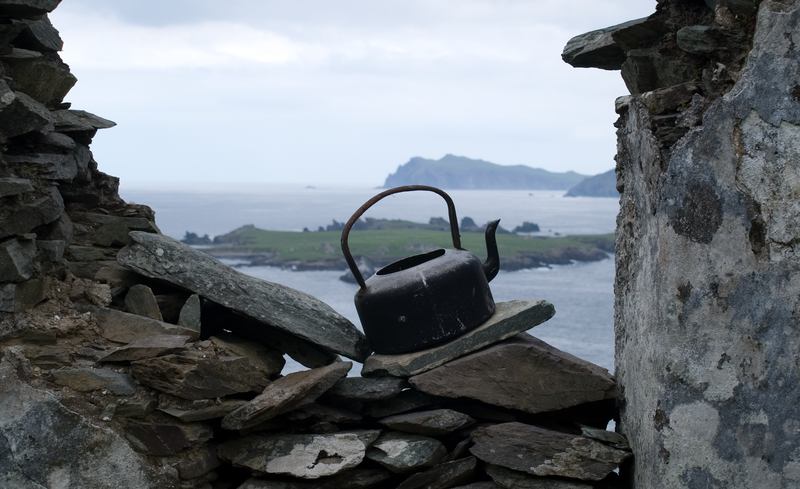 Until 1953, the inhabitants of Great Blasket Island formed the most westerly settlement in Europe. The small fishing community (even at its peak the population was hardly more than 150) mostly lived in primitive cottages perched on the relatively sheltered north-east shore. Over the ten years or so I have visited the island, the dispute on ownership and planning to restore and create tourist facilities has ebbed and flowed. Initially it seemed the vision was for a World Heritage listing which would mean no construction or restoration. Looking at planning minutes it seems the vision is now a somewhat less grand Irish National Historic Park which it would seem allow some facilities to be built. This year though I was amazed to see, even upset to see, what was a poorly managed (ie untidy material storage) construction site to restore / extend self catering hostel. In stark comparison to the solid construction of existing buildings, made of solid and local stone, breeze blocks had been flown in, packs split and not restacked, timbers not stacked, (artificial?) 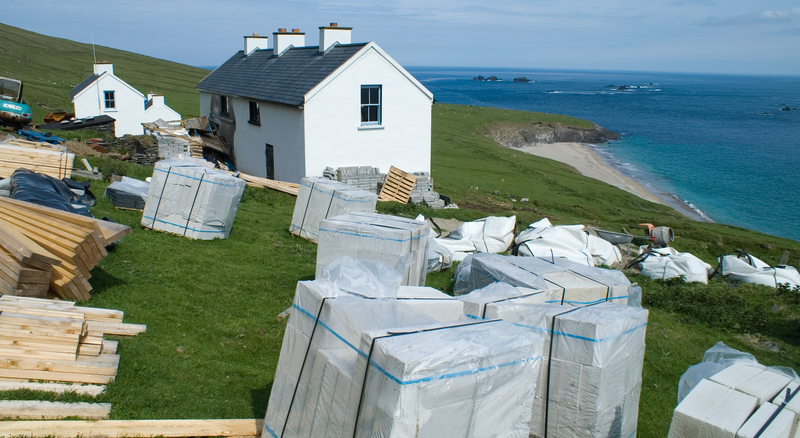 slates from Northern Ireland awaited on pallets. Earlier regulations would not allow any vehicles on to the island in an effort to preserve the pristine nature, now yellow diesel construction plant lay where it had been last used. Concrete and mortar spoils from the mixer hardened on the ground. What a fantastic opportunity for alternative construction practices and designs – wasted. The creation of an alternative construction technology and education center here would have been a wonderful message, showing we can work within a sense of connectivity to nature and heritage. Instead we have taken the easy route and failed. The roof of his home was made of a thatch of rushes or reeds and his sisters would climb up to collect eggs from under the hens nesting on top. One amusing episode in An tOileánach describes a neighbour’s family at supper when, to their bewilderment and consternation, young chickens began raining, one by one, onto the table and splashing into a mug of milk. “For God’s sake,” cried the woman of the house, “where are they coming from?” One of the children spied a hole scratched in the roof by a mother hen. Ó Criomhthain lived in a cottage or stone cabin with a hearth at the kitchen end and sleeping quarters at the other. A feature of island life was the keeping of animals in kitchens at night, including cows, asses, sheep, dogs, cats and hens. The islanders’ sometimes meagre existence was often supplemented by gifts from the sea when shipwrecks occurred. Timber, copper and brass were salvaged, as well as cargoes of food such as meal and wheat, which helped them to survive lean years. At one time tea was unknown on the island and when a cargo of the stuff floated ashore from a wreck it was used by one woman to dye her flannel petticoats (normally dyed with woad). She also used it to feed pigs. 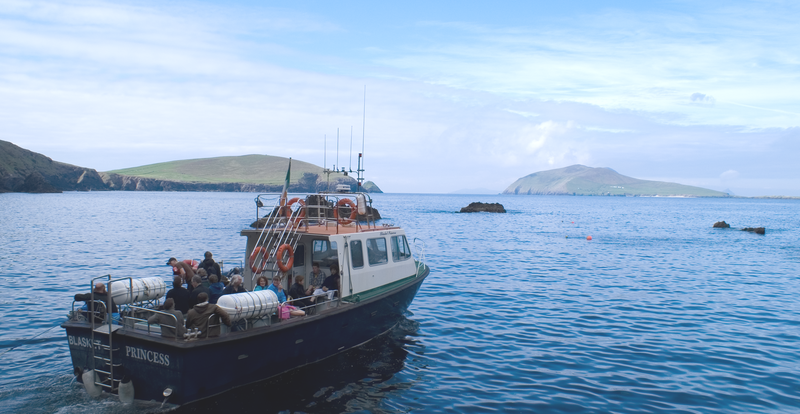 This entry was posted in comment, ecological, ecological footprint, literature, nature, sustainability and tagged Blasket Islands, connecting with nature on June 6, 2008 by martin brown. What a wonderful way to get away, but how disappointing to see such desecration of what seems to have once been a pristine area of our globe. Makes you wonder how such things are approved. And you are right, at a time when the world seems to be moving towards the adoption of green building practices, these decision makers have seemed to missed the boat.